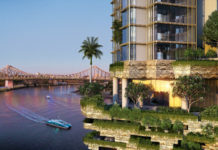 Morris Property Group have submitted a development application to build a 30 storey residential tower at 152 Wharf Street, Spring Hill. 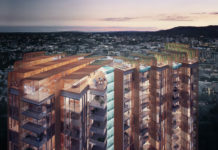 Designed by DBI Architecture, the tower proposal consists of 197 apartments and three ground floor retail tenancies. Level 6 incorporates indoor and outdoor communal spaces for future residents. The recreation area features a lap pool, spa, lounge decks, artificial lawn terrace, entertainment area, gym, teppanyaki bar and dining terrace. The proposal incorporates landscaping, including established trees, and streetscape works. The vision has been to create a building based on its location, form and quality; contribute to the surrounding neighbourhood on many levels and in a positive way. 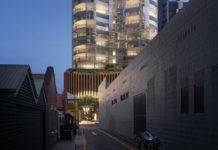 Particular attention has been paid to the building scale, so that it is both distinctive and visible in the city, but also embraces the local environment in one fluid motion. The desire for the building is to focus on providing housing at a price point which is able to be purchased by young singles and couples. This has required the design to be economically viable, meeting their demanding needs, and providing quality affordable accommodation. 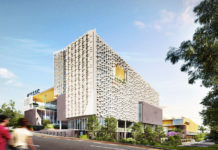 Additional value is brought to the building through its unique expression and identity which will stand out on the city’s skyline. The DA number for this development is A004583011.